There is a new paper in Nature this week on recent trends in ocean heat content from a large group of oceanographers led by John Lyman at PMEL. Their target is the uncertainty surrounding the various efforts to create a homogenised ocean heat content data set that deals appropriately with the various instrument changes and coverage biases that have plagued previous attempts. We have discussed this issue a number of times because of its importance in diagnosing the long term radiative imbalance of the atmosphere. Basically, if there has been more energy coming in at the top than is leaving, then it has to have been going somewhere – and that somewhere is mainly the ocean. (Other reservoirs for this energy, like the land surface or melting ice, are much smaller, and can be neglected for the most part). The main problem has been that over time the network of XBT probes and CTD casts has been replaced by the Argo float network which has a much greater coverage and more homogeneous instrumentation. However, connecting up the old and new networks, and dealing with specific biases in the XBT probes is difficult. An XBT (eXpendable Bathy-Thermograph) is a probe that is thrown off the ship and whose temperature readings as a function of time are transferred to a profile in depth from knowledge of how fast the probe falls. Unfortunately, this function is a complicated one that depends on the temperature of the water, the depth, the manufacturer of the probe etc. Various groups – working with the same basic data – have shown that there were biases in the XBT associated with incorrect calibrations and have attempted to make better corrections. Update (May 2012): The scaling of the model output on the original graph was incorrect, and the graph has been replaced with a corrected version. The original can still be found here. One thing that is interesting to note is that the interannual variability – particularly in the transition period between the two observing systems (1995-2005 say) is very dependent on exactly how you do the corrections, while the longer term trend is robust. This ties in directly with comments by Kevin Trenberth in this recent paper and in an accompanying commentary to the Lyman paper that while the energy budget changes over the long term are explainable, the changes over short time frames are still very difficult to quantify. As usual, this is unlikely to be the very last word on the subject, but this is more evidence that the planet is basically behaving as the scientists think it is. And that isn’t necessarily good news. Thanx for the review. Any hope of better data for the deeper ocean soon ? There is no mention in the paper of latent heat from the melting of Arctic sea ice. Moreover, it seems that the rise in heat content has paused since the year 2000 BCE. Could this pause be due to the thinning of the Arctic sea ice causing the additional heat to be absorbed by the latent heat of melting ice? good post and references.I too wonder about the calibration methods and deeper depth analysis. 700meters is very telling just the same. WOW! No wonder it is so cloudy and rainy here. Any ideas (or papers) on the mechanisms that cause the short-term variability, such as the large leap in the early part of the decade apparent in both estimates? When the trade winds return to normal over time, these values will change dramatically. And that isn’t necessarily good news if you believe the values will keep going up. Very strong trade winds and prolonged La Nina episodes in the near future is all that is required to reverse the trend. Sorry if this is slightly off topic, I am surprised that there is no mention on this website, or related ones, of http://data.giss.nasa.gov/gistemp/graphs/ showing that the global mean temperature for April set new records, and with it the January-through-April average for 2010. Isn’t this newsworthy? We have had quite high global temperatures for a while, but now we are breaking records again, aren’t we? The last prolonged La Nina episode “fully coupled” with the atmosphere was AMJ 1973 –MAM 1976: Over 30 years ago….A significant amount of warming is natural, how about we split it 50-50 (fair enough?). Uhh, Norbert, to the extent that I’m a related website, I’ve blogged at length about this record: NASA: Easily the hottest April — and hottest Jan-April — in temperature record, which notes we’ve set a new record 12-month global temperature, as predicted. It’s also been discussed at Tamino’s blog, Open Mind, here. Oops, sorry, that last link was to the sea ice extent numbers comment instead. Try this one, rather. http://www.komanoff.net/fossil/CTC_Carbon_Tax_Model.xls The American Power Act does everything but. If the American Power Act is enacted, we would still get 16.8 quadrillion BTUs of energy from coal in 2030. That would surely continue warming the oceans. Call your senators every day. Flywheel. That’s a marvelously intuitive yet physically reasonable way to put it. What, if any, effect on global temperatures 1s the Iceland volcano likely to yield? which shows 2009 sea surface temperatures. I guess it means that most of the ocean surface temperatures are something like 3.5 degrees C warmer than before. Is that correct? That is a lot. I am impressed that they were able to add up the data and make the calculation. There is a mountain of data, but it seems to be rather difficult to deal with. It seems to be sort of a “fuzzy” data set. Edward Greisch @ 10:14 pm, thank you for providing the link for the American Power Act. I’m very active in politics and can tell you that the forces driving the US towards further coal consumption (energy density of coal, domestic supply, labor employment, big-business/mining concerns etc.etc.) are essentially insurmountable. It drives me mad, but I’m hard-pressed to suggest alternatives. Imagine turning off your laptops for 23 hours/day, restricting your LCD TV and other electronic media….would any/all of you posters be so willing? We are all in this together, and yet I don’t sense any real appetite for sacrifice from Democrat (protect labor payrolls), Republican (protect industries), or otherwise. *sigh* the Earth will be a nice place for insects in about 50 years or so. Great link to the key resources. It is critical to read the Trenberth article and commentary, to fully appreciate the Ocean Warming work published and what remains to be done. It is hardly good news whether you are an ice shelf or a coral reef. I would have thought that the Greenland and Antarctic ice sheets and even the 20,300 cubic kilometres of floating ice in the Arctic would have been quite significant sinks. Since 1980 the Arctic has lost almost 14,000 cubic kilometres of ice; thats warmed up to zeroC, then melted. That’s a lot of Joules gone someplace other than the atmosphere! Since full melt of all grounded ice is equal to over 70 metres of sea level rise, then it follows that there is the equivalent volume of 70 metres of ocean surface that is currently existing as ice at less than zero C. If your measurements of ocean heat content find most of the heating occurring in the top few hundred metres, then this equivalent volume of water-as-ice looks like an important proportion of the total ‘ocean’ sink. Yet its ‘discounted’ as able to be largely neglected? Its not just the melting, but the ongoing increase in ice temperature with depth that demands a lot of heat input. Are there any systematic measurements of deep ice temperatures in Greenland or Antarctica that give any indication of the actual change in energy content of all that ice, outside what is needed to crack the latent heat of freezing? DeFazio’s seat is not at risk. The Republicans will focus on the 1st and 5th district. Pielke Sr. posted on this: http://pielkeclimatesci.wordpress.com/2010/05/21/update-on-jim-hansens-forecast-of-the-global-radiative-imbalance-as-diagnosed-by-the-upper-ocean-heat-content-change/ – but of course, can’t just come straight out and admit that he was flat out wrong (http://pielkeclimatesci.wordpress.com/2009/02/09/update-on-a-comparison-of-upper-ocean-heat-content-changes-with-the-giss-model-predictions/) and that models and ocean heat content match but rather, now we have to wait a few years to know if models are correct. 17 CRS: There is no reason to go without electricity. Again read “Storms of My Grandchildren.” I agree with Dr. Hansen and President Obama that we have unlimited safe clean cheap nuclear power available as well as large amounts of wind, solar and geothermal depending on geography. The only real problems are the $100 Billion cashflow of the coal industry, the $1 Trillion cashflow of the total fossil fuel industry and people who object to nuclear for reasons unknown to me. Please, I am not trying to start another interminable debate. Please argue with Hansen and Obama on nuclear. Both industry [except the fossil fuel industry] and labor can easily be protected and benefitted by a change in energy source. The economy as a whole can grow because of the changes in energy sources. The fossil fuel stockholders would be better off to sell out sooner rather than later, but they refuse. It is CO2, not energy use that we are fighting. The American Power Bill shows that we have made progress. Keep calling your senators. The units used to measure heat content on the graph are in 10^22 Joules. It would be helpful if this could be converted to more familiar units, such as watts per square meter required to generated this much heat, or the number of degrees Celsius this will raise the water temperature. By the way, I am pleased to see two science postings in a row! OK, I’m no expert so this may be a trivial question. Could the ocean floor absorb a non-negligible amount of heat? With the greatest of respect, that sort of understated, scientifically detached and dispassionate discourse is not helpful. The “news” is extremely, shockingly, horrifyingly BAD. Obviously the deep ocean >700 meters is the most difficult place to sample temperature changes (and to drill for oil). If you have good measurements of upper ocean and atmospheric temperatures, then if you had a good decade-long satellite record of the Earth’s total radiative energy balance from space – say, if Triana has been launched to in the late 1990s – then you could use conservation of energy to calculate the rate of heat uptake by the deep ocean over the past ten years. Since this satellite wasn’t launched – the fossil fuel lobby managed to block funding for Triana with some political assistance – you’d instead have to rely on the stitched-together records of near-Earth satellites. The spatial distribution of tropospheric and stratospheric temperature trends for 1979 to 2005 was examined, based on radiances from satellite-borne microwave sounding units that were processed with state-of-the-art retrieval algorithms. We found that relative to the global-mean trends of the respective layers, both hemispheres have experienced enhanced tropospheric warming and stratospheric cooling in the 15 to 45° latitude belt, which is a pattern indicative of a widening of the tropical circulation and a poleward shift of the tropospheric jet streams and their associated subtropical dry zones. This distinctive spatial pattern in the trends appears to be a robust feature of this 27-year record. Simulations of the enhanced greenhouse effect forecast a warming trend of approximately 0.25 to 0.35º C per decade, or accelerated warming compared to the surface. The well-validated temperature of the low troposphere shows a significantly smaller trend, +0.077º C per decade. In fact, Fu et al. report tropospheric mean rates of +0.20 K per decade, as well as stratospheric cooling of -0.33K per decade, well within the ranges predicted by global climate models forced with fossil fuel emissions and ozone changes. Marcus, that was a good summary with pointers, thank you. Denier sites use the NODC OHC data as it shows a mini-trend of cooling. Why is Lyman et al more accurate? Mr. Dowden, I think I have the conversion from Joules to degrees Celcius for the scale, but corrections to my math are very welcome for my hasty calculations. My approach was to convert joules into calories and then apply that to the volume of the ocean. I converted the measureable scale span into calories. Then Cubic area of oceans (cubic KM) to milliliters. Finally, milliliters divided by calories. 2×10(23) (measurable scale) x 4.184 (calories per Joule, which is also what is required to raise 1 ml of water one degree celcius) = 8.37×10(23) calories. 1.33×10(24) milliliters of ocean water divided by 8.37×10(23) (total calories) = 1.59 degrees celcius for the entire measureable scale. Loads of problems with my calculation – let’s consider it a rough thumbnail. First, the study measured the top 700 meters, so using the entire volume could make the whole thing hopelessly wrong. Second, I relied on the good old Internet for ocean volume, so that might be wrong, invalidating it. And third, I’m a bit rusty and might have used some Jethro Clampett “Cyphering” on the math. At any rate, the big thing is that there is a helluvalot of energy getting absorbed into the ocean. Can freshening of the polar oceans have sufficiently increased (but been inadequately measured) so that down welling is reduced, and therefore the deep ocean is hiding a pause in its warming? The best estimates of sea level rise would be insensitive to such a change – except for the very small non-linearity of the density of sea water with temperature. And that might account for the small anomaly between SLR and upper ocean heat content for the last decade? Re Toppy – assuming the equilibrium climate (as measured by global average surface temperature) doesn’t shift with ENSO, a La Nina should actually cause a gain in heat. My understanding is that ENSO changes the global average surface temperature by vertically rearranging the heat in the ocean. By exposing colder water over a larger area of the surface, a La Nina would cause a radiative imbalance that leads to some heat gain. An El Nino would have the opposite effect. The positive feedbacks reduce the imbalance in that case, but they would prolong the time it would take for the global average surface temperature to return to equilibrium if the La Nina or El Nino were permanent. Trenberth’s paper says: “Human activities contribute directly to local warming through the burning of fossil fuels, thereby adding heat, estimated globally to be about 4 x 10^20 J/yr …” So the unit of 10^22 J/yr is about 25 times all the heat released from fossil fuel combustion. Given the trend in OHC from the Lyman graph is slightly less than 1 X 10^22 J/yr, then we can compare the yearly trend of 0.64 W m-2 to get an idea how OHC compares to the planetary energy budget. 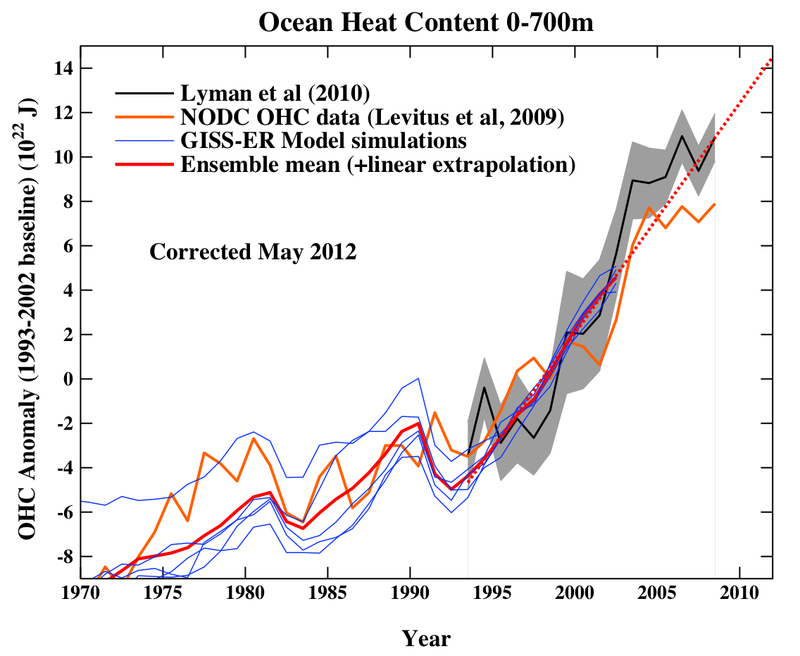 This seems to show that a significant amount of heat is ending up in the deeper ocean. Another issue that seems to be problematic; the recent flattening in OHC seems inconsistent with SLR, which currently is close to the long term trend. I don’t think that increased ice sheet melt can explain the difference. It will be interesting to see if the Argo data show areas where significant amounts of heated water is being pushed down into the ocean. Perhaps the delivery of heated water into the deeper ocean is spatially distributed in a highly irregular pattern. Clearly we don’t have enough information on how heat is being absorbed into the ocean heat sink. I hope I have interpreted these papers correctly. So a La Nina warms the planet and an El Nino cools the planet even though we think of them the opposite way. 24 Edward: Thanks for the conversation! And, just try to take coal away from politicians of any stripe from a producing state!! Illinois is having a coal renaissance, our high-sulfur coal is cheap and popular….utilities can scrub the sulfur out of the off-gas for less money than higher-cost Wyoming low-sulfur coal. The Democratic party is in lock-step with union forces, and won’t be turned back. *sigh* It will be easier to deal with the chemical and geoengineering aspects of carbon mitigation (I’ve done this work under the Kyoto CDM) than with the political forces!! Don’t forget, even if the USA halted all coal consumption, we would have to deal with China and India etc. It is damn frustrating, I share Dr. Hansen’s feelings. I feel like I want to write a sequel book “Arthropod Plagues of our Grandchildren.” At least insects are high in protein…. Trenberth’s article is a good example of an honest assessment of the state of climate science, and the limitations of the data and our understanding thereof. It doesn’t alter the Bayesian prior that increased CO2 is likely to cause warming to be upfront about the limitations of our understanding or of our data gathering status. It is the opposite of what we have come to understand about other segments of the climate science culture, both in its honesty and realization that humans will adapt whatever actually transpires. There is no mention in the paper of latent heat from the melting of Arctic sea ice. 0.143 percent	going into ice melt spring – summer; BUT, a roughly equal amount comes back out during the refreeze in the fall – winter; and since it’s floating, it doesn’t effect sea level. BTW, I have been known to miscount decimal places, so I wouldn’t bet a large amount that these numbers aren’t off by a factor of ten – YMMV, and one[Alistair & Nigel] would learn a lot by checking these estimates with other numbers – e.g. the TOA insolation is ~344 W/m^2; starting there, do my numbers still make sense? If you Google the best estimates of runoff +thermal expansion contributions to sea level, and assume that the none thermal expansion part came from permanent ice melt, do you get similar volume numbers? Gavin (8), then you’ll have to explain your poor results to the Affirmative Action people! But computer models are entirely built on assertions, no? You may argue that those assertions are justified, but the model itself is not the actual system. The post says “if there has been more energy coming in at the top than is leaving, then it has to have been going somewhere “. And another comment of yours says: “the increase in ocean heat content is pretty much what is expected from the anticipated radiative imbalance “. Both implying that there has been no actual measurement of the actual radiative imbalance. I had a long discussion on this forum several months ago regarding the ability to directly measure radiative imbalance from outside the atmosphere, and no one seemed particularly interested in it. Any papers on this that you could point to? What sort of temperature rise in deep ocean basins would be sufficient to destabilise clathrates? Does anyone know? I wish I could remember where I read it, but I seem to remember that the margins of methane clathrate deposits are more or less at equilibrium w/regard to their response to temperature and pressure which of course completely figures. That being the case, I suppose any change in temperature or pressure conditions will cause a change in the location of the margins. Presumably a larger change will cause a larger movement of margins and a more rapid change will trigger a more rapid movement of clathrate margins. Sort of the same deal with ice; it’s automatically adjusted to prevalent conditions and hence quite sensitive to changes. Well, we can all read into Trenberth what we wish, but let me quote what he actually says. then adapting to the climate change is an imperative. It seems to me that Trenberth is not particularly more sanguine than “other segments” about the prospects. That conclusion is based not just on this article but also on other things he has written. In any case, the article is not at all about just how alarmed we should be. It is rather a call for resolving uncertainties to help us better cope with climate change. Mike G (40) — You can find the phase diagrams of pressure versus temperature for clathrae stability and compare those to temperatures at various depths. Somewhere there is a graphic of that. Briefly, the only (moderately substantial) clathrate dissolutions are in/near the Arctic Ocean at shallow depths. The vast majority of the methane released remains in the ocean. Of greater conern are the resevoirs of methane in wetlands and permafrost. #9 – #11: OK, I’m glad it wasn’t a secret anymore. :) However 1 blog post and a few comments by Kevin himself here and there isn’t a lot of coverage. Probably most here take it for granted that temps are rising. It seems that only a complete record year, with a confirming result from CRU, would count. Looking at the (Gistemp) graphs, as a non-expert, it doesn’t seem that records can easily be broken by “weather” alone, and recently we are consistently close to record temps. Perhaps not enough to convince those who believe everything is a result of urban and arctic heat islands, but I think enough of a signal to send to those who are not following the graphs by habit, but occasionally stop by, trying to find out what the facts are. 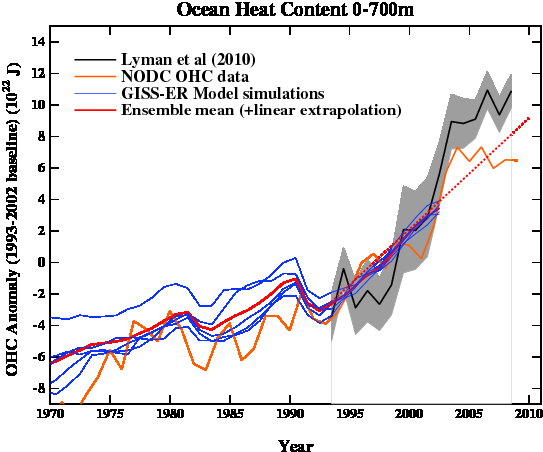 Apparently, in the years around 2001-2002, there was a very steep increase of ocean heat as measured. The time span after 2003 doesn’t seem that unusual if one considers the possibility that the high values around 2003, and the low values shortly before the 2001-2002 period, have been “weather” rather than “climate” and are obscuring the underlying continued upward trend. Again, (speaking as someone occasionally stopping by), these articles highlight that the quality of the models are not the bottleneck of research, but the acquisition of measurement data. Which, in turn, I would guess, is mostly a question of financial resources. However, it doesn’t seem that climate research is already consuming huge amounts of resources, so I wonder whether the resources are not increasing as one would expect, or whether this is just not being discussed in public, or whether I just missed it due to the specific limited reading I do. I read somewhere that NASA recently was able to start using 2 drones for atmospheric measurements. But what about increasing the number of arctic measurement stations, as apparently the mismatch between NASA and CRU results indicates a lack of data here, and what about the question of whether the uncertainties in this article about ocean heating could be resolved by improving resources. (BTW, what about measuring the temperature of the ice, rather than just whether it melts or not, don’t know if that makes sense). The authors obviously wish for better measurement data, but it doesn’t become clear (to someone like me) whether technically solutions are ready to improve the situation, if financial resources were available, and whether any financial investment could be expected to be spent well in technically effective ways. I’m sure these questions are discussed elsewhere, but it doesn’t become clear to me here in this context. If the measured Global Sea Surface Temperatures as measure by AMSR-E since 2003 vary between +2 C and – 2.5 C, and the trend has demonstrated a slight decline, whom should we believe? The models which report a continuing increase? Lyman et al 2010 who adjust the raw data for an extrapolated result? or consider a pie-in-the sky speculation that the “missing” heat now resides in deeper and as yet unmeasured oceans? This article cries out for an editor to say “show me the beef.” The article has none, just mouthing words. Sad, sad sad. Mr. Benson, where can I find a frostline/treeline map, and if there’s been a measureable change in them. To be honest, its something I’ve been waiting to read about. If the tundra is slowly giving way to the boreal forest it will be the “in your face” sort of symptom of global warming that is far more convincing than a weather event. Oh, and did anyone check my math in the scale conversion? I’m gonna relook it, as I think I may have misplaced a decimal point. 1.6 degrees celcius seems to be too large for the range of temperature increase. Sallie Baliunas was so surprised by this result that she threw in the towel and declared that the skeptic’s argument no longer holds much weight. Ike, that’s fantastic news! Can you provide a cite? I could have used it in a recent face-off with a couple of D-K-afflicted parties.